← Fountain Hills’ Docent Led Art Walks: The Key to a Spectacular Public Collection! The Fountain Hills Theater shines the brightest with its musical productions. The intimate venue transports the audience inside the story with the actors, the live music and unique choreography casting its spell. 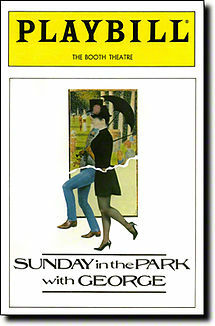 Sunday in the Park with George is a musical with music and lyrics by Stephen Sondheim and book by James Lapine. The musical was inspired by the painting “A Sunday Afternoon on the Island of La Grande Jatte” by Georges Seurat. A complex work revolves around a fictionalized Seurat immersed in single-minded concentration while painting his masterpiece and the people in that picture. The first Broadway production opened in 1984, winning the 1985 Pulitzer Prize for Drama, two Tony Awards for design (and a nomination for Best Musical), numerous Drama Desk Awards, the 1991 Olivier Award for Best Musical and the 2007 Olivier Award for Outstanding Musical Production. Shimmering with love and light, this unique, inventive musical is one of the most acclaimed shows of our time. Sondheim’s soaring score and James Lapine’s award-winning book intertwine with Seurat’s distinctive art to create a moving, poetic drama that explores the complexity of life and the art of understanding it. This entry was posted in Area Events and tagged Fountain Hills Theater, Sunday in the Park with George. Bookmark the permalink.